HEAT a heavy-duty, large skillet or grill pan over medium heat. Spread butter over one side of each bread slice. On two of the slices, spread the unbuttered side with pesto, just enough to cover the surface. 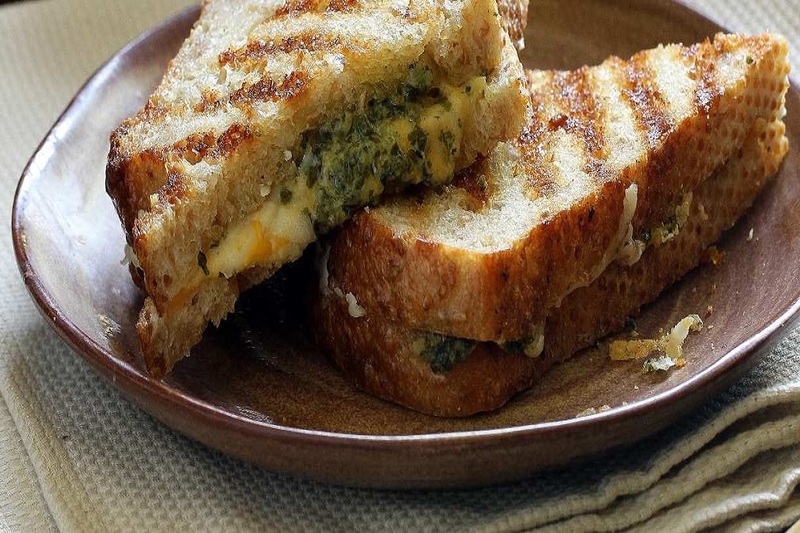 PLACE slices of bread with pesto, butter-side-down, in the skillet. Sprinkle cheese evenly over bread in the skillet. PLACE remaining slices of bread over the cheese, butter-side up. Cover skillet loosely and cook for about 3 to 4 minutes, or until golden on bottom. Uncover; carefully flip the sandwich over. Cook uncovered for 3 to 4 minutes or until cheese is melted and bread is golden brown. Slice in half and enjoy immediately (with a side of fresh veggies and fruit).